Welcome back to Words and Their Stories from VOA Learning English! Each week we explore the roots and meaning of common American expressions. Today let’s talk about apples. The saying “as American as apple pie” describes things that represent the best of American culture. People use this expression when talking about things like blue jeans, baseball and rock-n-roll music. But why use apple pie? Why not some other fruit, like a cherry or peach? 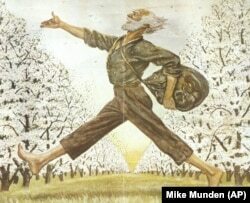 The reason might be a man known as Johnny Appleseed. Yet Johnny Appleseed was a real person. It was the name given to a man named John Chapman. Many Americans consider him responsible for popularizing apples in the United States. Perhaps the story of Johnny Appleseed has made apples and apple pie so very American. Historians can debate that. But this we do know. Apples are at the core (Get it? “Core” is the center of the apple.) of many common sayings. Many apples fall from trees when they are fully-grown. When we say that an apple didn’t fall far from the tree, we are describing children who are very much like their mother or father. And this can be for both good and bad reasons. As we said, John Chapman’s father was a farmer. So, we could say that Johnny Appleseed’s apple really didn’t fall far from the tree. That takes this expression to a whole new level! Naturally, apple growers need a way to transport their produce to market. This is where a vehicle called an “applecart” enters the story. It must have been a big mistake years ago to upset or overturn someone’s applecart. In American English, you have upset the applecart if you ruin someone’s plans or go against the usual way of doing things. The first recorded use of applecart being used in this way appeared in 1788. A man named Jeremy Belknap wrote in The History of New Hampshire that "(John) Adams had almost overset the apple-cart by intruding an amendment of his own fabrication (making) on the morning of the day of ratification" [of the Constitution]. This is yet another example of how apples seem very American. The only thing bad about an upset cart of potatoes, for example, is that potatoes are all over the ground. So, the word apple appears in many American expressions. But does that mean we should eat one every day? You would think so, if you hear the saying, “An apple a day keeps the doctor away.” That is not scientifically proven. But eating an apple a day can’t be bad for you. Apples are about 85 percent water. They can help you feel full. Also, they travel well. In other words, they rarely get damaged when you carry them in a bag, unlike other fruits (Yes, I’m talking about you, Banana!). So, apples are good for us. And someone who does good things can be described as a good apple. But there are also bad apples. And we all know that one bad apple spoils the bunch. Let’s say there is a classroom of very well-behaved children. All the students are respectful. They do not shout or speak out of turn while the teacher is talking. Then a new student arrives. This student talks loudly and shows disrespect to the teacher. Soon other students follow her lead and disrupt class. In this example, you could say that one bad apple spoiled the whole bunch. Now, students who misbehave in class are not necessarily bad people. But, if the student we just talked about also steals apples from the store and then throws them at very old women, you could say she is rotten to the core. This expression is the same as saying, “Well. What do you think about that?” It can also be a way of showing you like or admire something. The grammar is main reason this expression sounds warm, folksy and rural to the ear -- well, the grammar and the apples. And remember, it sounds like a country or rural expression. If a good friend tells you that their original cake recipe just won first place at a baking competition. “How ‘bout them apples? !” would be a great response to that news. However, if a friend from New York City tells you that they just won a high-profile writing award, you might want to say something else. But, comparing language used in a small, farming town with the language used in a city like New York is like comparing apples and oranges. There is no point because they are both so different. Anna Matteo wrote this story for Learning English. George Grow was the editor. At the end of the story, Don McLean sings his 1971 hit song, "American Pie." Are apples popular in your country? And does your language have idioms or expressions that deal with apples? Let us know in the Comments Section! fabricate – v. to create or make up (something, such as a story) in order to trick people : fabrication – n.
ratify – v. to make (a treaty, agreement, etc.) official by signing it or voting for it : ratification – n.